Hello all. This is our first tutorial after a long time of being under maintenance. In this tutorial we are going to learn how to program an app in visual basic that can solve quadratic equations. A quadratic equation is a second-degree polynomial that has the form “ax^2 + bx + c = 0.” The “a,” “b” and “c” are the constants and “x” is the variable. 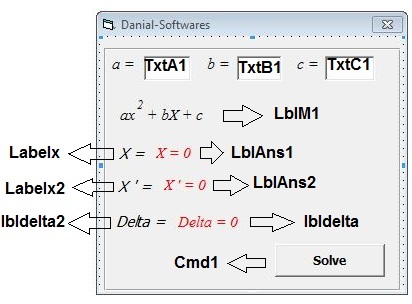 When you solve a quadratic equation, you must have the values of the constants and solve for x, which always yields two values, called the “roots.” In Visual Basic, you can write a program or function that prompts the user to enter the a, b and c values, find the roots and then display the values on the form.